Maintenance crews are mobilizing to remove snow and ice from sidewalks, parking areas, and MetroLink platforms. We keeps large containers of salt on platforms for easy application. Locations with the highest number of passengers receive priority attention, but Metro addresses needs at all locations. MetroLink trains operate on steel rails and are powered by electricity delivered by wires above the trains. Heavy ice and snow buildup on the rails and wires make operation difficult or impossible. Wires in locations prone to ice build-ups already have been protected by the installation of wire caps designed to minimize electrical faults caused by wet weather. 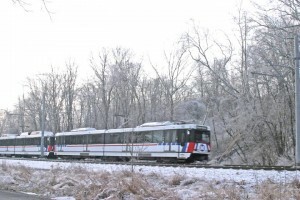 The trains are also equipped with heated, ice-cutting mechanisms that use a hard surface to cut through any ice or snow that collects on the overhead wires. Using the ice cutters require the trains to reduce their top speed to 45 mph from the normal 55 mph. If the tracks get too slippery, boxes inside the train will drop sand onto the rails to increase friction. Metro will run the trains all night to keep the tracks and wires clear of snow and ice build-up, but will not carry passengers after the regular weekday schedule ends. If roads become icy and slippery, expect some delays on MetroBus routes. Just like other vehicles, they are subject to poor road conditions during snowy weather, and may take longer to reach riders. Snowy weather is beautiful, even as it wrecks havoc on St. Louis transportation. Just remember to dress warmly and be safe out there as everyone is heading home and traveling through our first snowfall of 2010. People without cars are alive 24 hours a day in a major city. Sometimes they are drunk and need to catch a train at 3 am. Sometimes, they just need to get to the airport early from their home way off in Belleville. Maybe they work at a gas station, hotel, or diner until the early morning hours. There is no reason to stop service altogether in the early morning hours, especially when it’s cold. Reduced service yes, but not stopped altogether. Running a single car every hour for instance would not be a great strain on the system, but it would be a great relief to hundreds of people with no choice but to drive drunk, walk incredible distances, or call a taxi. Running the trains at night without passengers. Awesome job, really. Once again reminds us how important light rail service is!